Quinn was born October 9, 2016. So a few days ago, she turned ONE! We were going to go to the dog park but Tropical Storm Nate went by and that place turns into a mud pit when it rains. We hope to go this weekend, if it doesn’t rain again. Heck, we may just go anyway! Nate’s presence on her birthday was ironic. Quinn and her siblings were born right after Hurricane Matthew hit the east coast. Cathy Rubens and her home got some of the rain from it. So all of the litter were given weather related names. Hence why Quinn is Silverhill’s Rainbow After the Storm. The day after her birthday, I took her to Lowe’s on her first Public Access training session. It’s main goal was to see how she did with all this new stuff. She has gone places before, but they were definite dog friendly places and it is usually a disaster. I think dog friendly places, like pet stores, are just too much for young dogs. It either shoves them into overload or they party. Quinn parties. Anyway, the trip out went very well. Quinn was sniffing a lot, which I expected. She had no problem with the store’s scooter. She had no problem with the obnoxious beeping it makes when it backs up. She had no problem with all the stuff in the aisle, people pushing weird carts with big things on them, all of that. She wasn’t perfect, but I wasn’t expecting perfect. I wanted to observe, see what makes her pause. With Joella, because of her self-esteem issues, I allowed people to pet her if they asked. I don’t think I can do that with Quinn. After I let someone we knew pet her and after an employee did (after asking!! ), she was going to everyone that passed by. So we won’t be allowing that for a while! I love this dog. A lot. I think she is going to work out. I did not name Quinn after the old song, “Mighty Quinn the Eskimo”, although I do jokingly call her Mighty Quinn. I actually named her after the fifth element, quintessence. Also known as “aether”, it is the “material that fills the region of the universe above the terrestrial sphere”. Physicists know it as “dark matter“. Fittingly, Quinn is rather dark and she is a force to be reckoned with. 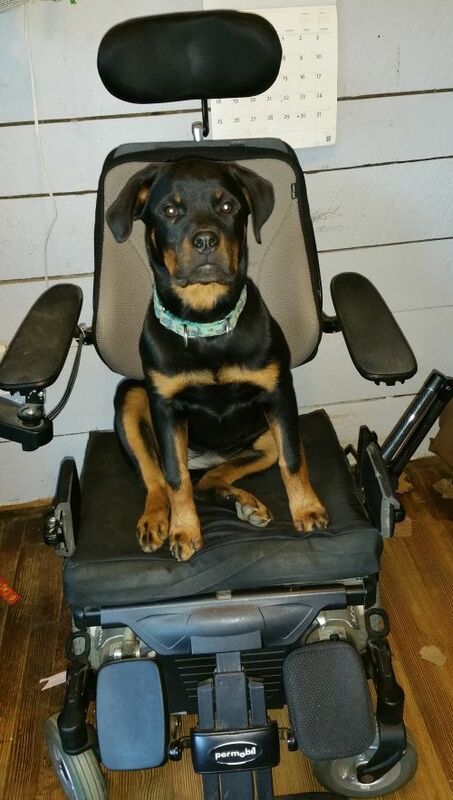 Quinn was purchased from Cathy Rubens of Silverhill Rottweilers here in NC. Since the litter was born Oct 9th, 2016 right after a Hurricane Matthew came through the area, Cathy decided the theme would be storm related. So I named her Silverhill’s Rainbow After the Storm. We’ve never had a puppy that young before so it was, and still is, a challenge! That was the Storm. As Quinn matures, her Rainbow comes out more and more. She is a smart girl, loving, and adorable. She’s also strong willed so the storm is still around. I looked for over 3 years for Quinn. My first Service Dog, Joella, died in Dec 2012. A year later, we took in Whisper, an 8yr old German Shepherd who had been someone’s Service Dog. Her health wasn’t good so we retired her, giving her small jobs here at home to satisfy that GSD need to do something. By then, I was thinking it was time to start looking for a full breed Rottweiler. I had Mike who I had gotten to “replace” Joella back in ’08 but he did not work out. I again tried to see if he was willing to work but he just didn’t seem to want to. I wanted a full breed dog and I wanted a puppy. Because of fostering and rescuing, we have had 11 dogs stay, 14 cats stay, and 15 foster dogs/cats come and go. That’s 40 critters since 1992. I figured if I wanted to pay big bucks for a full breed dog, I can do so guilt free. I could not have gotten a puppy without my friends on Facebook and in Real Life. Two friends encouraged me to start a GoFundMe page and I did. Then another friend (Lynn Ames) heard of it and announced it on her Facebook page. Donations exploded. I did not reach the ultimate goal but it was more than enough to help quench the holes in my wallet. Quinn is worth every cent. From the new fence to the health guarantees, it is all worth it. She came with no baggage, no trauma, no unknown health history. I know every bit of her life from birth until I put her in the truck to bring her home. So, yeah, the money is worth it. Looking for the right breeder was not easy. Long story short, I chose Cathy Rubens. I talked to her on the phone a few times. We picked an upcoming litter and I sent in the deposit. I was getting a puppy! And I knew I was getting the right puppy when the bring-home date for her was going to be on the same day I brought Mike home all those years ago. Anyway, this is her…blog I suppose. She has a Facebook page (@QuinnSD) and she has her own Instagram (Quinn the Rotten SD) and I may some day start her a sarcastic Twitter account just for giggles. This website has been here for a while but I wanted to wait until she started Service Dog training before I did anything with it. She’s not officially doing any of that but she is moving in that direction. More on that later!